Talk about blowing smoke … a few of the claims made by new entrants to the marine diesel particulate filter market might well be described as smoke and mirrors or at best a dose of hot air. Among the more dubious claims made on websites and service truck doors is one that promises “up to 99%” reduction in soot production. Thanks to regulatory requirements imposed on diesel emissions from on-road vehicles, diesel particulate filtration is a huge industry based on a mature technology. Millions of particulate filters have been installed since being mandated for all diesel powered trucks since 2007. The filter elements used in marine particulate filter systems are nearly identical to those used on both mobile and some stationary diesel exhaust systems. The large body of research by diesel industry members and regulatory agencies defines particulates as PM2.5 (2.5 microns or less in size) and ultrafine particles of less than 0.1 micrometers in size. Particulate filter efficiency is measured as a percentage of particles above 0.2 microns in diameter removed from the exhaust stream. The figure most commonly used by the filter manufacturers and regulators to describe filter efficiency is between 90 percent and 98 percent. While it is possible to capture 99 percent or more of the particulates departing a generator, the size of passages in the filter media will be so small as to impose a large restriction to exhaust flow and create engine damaging high back pressure. Lower back pressure and good filtration can be obtained by using a larger filter but this technique is subject to diminishing returns. The larger filter requires more engine room volume, regeneration may become problematic due to uneven internal exhaust flow patterns and poor heating … the filter might be hot in the center but cold on the outside. Both of those conditions lead to reduced service life and increased exhaust back pressure. The bottom line on filter efficiency claims is the fact that a clogged filter is the most efficient, when it reaches 100 percent it will not allow any exhaust gas to flow. “No heat generation” is another claim that should be an embarrassment to advertisers. Regeneration, the removal by combustion of captured particulates, generates additional heat. Virtually all filters are coated with a catalyst which promotes the ignition of particulates at a temperature lower than their “self ignition” temperature. The heat released by combustion of those particulates and unburned hydrocarbons (diesel fumes) raises the temperature of the filter and the exhaust gas above that at the filter inlet. The only way to reduce or prevent an increase in engine room air temperature is by using an experienced marine exhaust company known for its careful attention to the design and installation of insulation blankets. Passive regeneration might best be described as a faith based process. As a prospective purchaser of a diesel particulate filter system you may find the relative simplicity and lower acquisition cost of a passive system appealing … buy it then hope that it works. The reality of passive regeneration is rarely close to the sales claims. Passive systems have left many owners and engineers with regrets since their introduction to the yachting industry. Horror stories of systems failing within a few hundred hours or a few short weeks are common. Exhaust gases entering a passive filter must be hot enough to start a chemical reaction between particulates and the filter catalyst. Many generators are capable of producing exhaust gas at a temperature high enough to initiate and maintain regeneration, but only when they are operated at a high percentage of load for long enough to complete the process. If you are contemplating the installation of a particulate filter system it is probably because your generators are “dirty.” They probably run at low loads and do not meet the minimum conditions required for passive regeneration. The major source of soot and particulates is poor combustion and poor combustion rarely creates exhaust temperature high enough to regenerate a passive filter. Salesmen who promote passive filters claim that their systems use special catalysts to initiate regeneration at temperatures as low as 250°C. Even the worst running generators can produce that temperature. The rest of the story is that the precious metal catalysts used on those filters were developed for use on highway vehicles; cars and trucks that are required by law to burn fuel with less than 15 parts per million sulfur content. Sulfur is a poison to precious metal catalysts, it kills them chemically and coats the survivors with an impervious chemical layer that prevents them from working. If you plan to operate your yacht only in North American waters and avoid most of the Caribbean and Eastern Mediterranean then passive filters might work for you. If you load fuel anywhere other than North American (and many European) ports, the likelihood of being delivered a load of high sulfur content fuel is very high. Even when ordered and the bunker ticket specifically states “ULSD” was delivered, we have found many yachts with sulfur content above 600 parts per million, and that was after dilution from later fuel loading. EnerYacht, the developer of the SeaClean® exhaust treatment system began business by retrofitting its patented thermal management components to failed passive systems. While this effort saved the captain and engineer a great deal of embarrassment and saved the owner from having to remove the nearly new system, it only delayed the inevitable (and expensive) replacement of passive filters. The costs of ownership far exceeded the initial purchase price due to costs associated with reduced filter service life. SeaClean® is an active particulate filter system that is the culmination of decades of hands-on operational experience with marine diesel engines combined with decades of DeAngelo Marine Exhaust’s experience in manufacturing and installation to the highest standards of commercial, recreational, and military marine exhaust systems. SeaClean® is the first and only truly successful electrically heated active particulate filter system. It is unique in operation because unlike our competitors, our patented system ensures near constant regeneration across the widest range of generator output. SeaClean® does not wait until exhaust backpressure rises to high levels before attempting to burn off accumulated soot. Generator operation is smooth and constant due to a consistent level of low exhaust pressure. 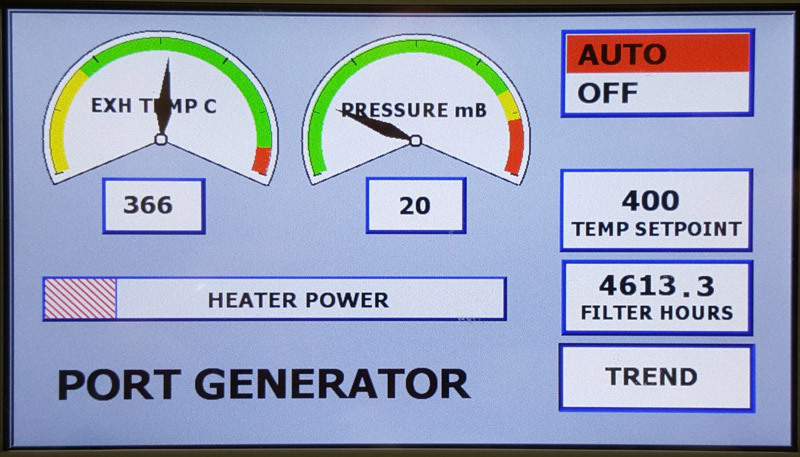 SeaClean’s control system allows it to act as a loadbank at low generator loads and smoothly tapers heater power to zero as the yacht’s electrical load increases. No power is wasted on regeneration when it is needed by the yacht’s own systems because the filter does not require periodic regeneration to relieve excessive exhaust back pressure. We have many systems installed in which exhaust backpressure is at or near the same level as at commissioning thousands of hours earlier and have yet to require maintenance or cleaning. A marine generator exhaust treatment system is an investment, not just in cash but in the environment, the marketability of a charter yacht, and the joy of surrounding the yacht with clean air and water. Carefully consider the options available and look very closely at the total cost of ownership over the life of the yacht and its resale value. Then contact DeAngelo Marine Exhaust for a realistic evaluation of your options.